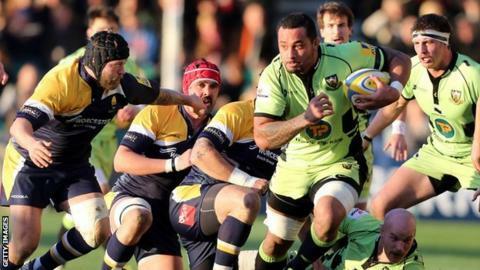 Northampton had to twice come from behind at Sixways as they extended Premiership bottom club Worcester's losing start to the league season. The hosts led 7-6 at the break thanks to Ignacio Mieres converting his own charge-down try after two Stephen Myler penalties for Saints. Chris Pennell replied to another Myler penalty to edge Warriors back in front. But three late converted tries from Samu Manoa, Tom Collins and Tom Wood finished the hard-working Warriors off. Myler added two more penalties, as well as his three conversions, to finish with an 18-point individual haul - and keep his team in second place in the table, two points behind leaders Saracens. Worcester have now lost their last 14 Premiership matches - a run stretching back to last season, when they recorded their last league win, 29-23 against Wasps on 1 March. Worcester are now 10 points adrift of London Irish at the bottom having picked up just two losing bonus points all season. Yet, even up against a Northampton side missing Wales winger George North, such are the depths to which Worcester have sunk that this was actually perceived as their most encouraging Premiership performance of the season. Even without two of their Argentina forwards - Gus Creevy and Leonardo Senatore - they matched the Saints up front before the break. And although Myler's two penalties looked set to earn an interval lead, Saints winger Ken Pisi's try having been chalked off for a forward pass, the visitors were stunned when Worcester went in front just before the break. Myler's clearing kick was charged down by impressive flanker Sam Betty and Mieres ran on to claim his first Premiership try for the Warriors. Mieres, who had badly missed Worcester's first attempt at goal early in the first half, converted from in front of the posts. But, as at Sale last weekend, full-back Pennell took over kicking duties after the break, restoring Worcester's lead to 10-9 after Myler had edged the visitors back in front with his third penalty. Bolstered by the arrival of England duo Courtney Lawes and Phil Dowson, lock forward Manoa burst through to score Saints' first try - and class told as Northampton never trailed again. After Myler had kicked a fourth penalty, winger Collins went in at the left corner and former Warriors flanker Wood completed the home side's misery to give the scoreline a slightly unfair reflection with the third try. "I'm pretty pleased. It was a tremendous 50 or 60-minute effort. We're starting to understand the game, to do what works for us. "We're starting to be a collective force, to buy into some of the systems. We've just got to close the gap between the 60-minute and the 80-minute mark. "We're on the back end of a poor penalty count again. Sometimes, it's easy to favour the big powerhouse side that rolls into town, We've asked that question again. "But you've got to get on with it. That's where we are as a club, seeing opposition being able to come along and roll the likes of Courtney Lawes off the bench." "An hour in, we were getting a bit worried. Generally, our game was a little bit sloppy. "Worcester were up for it and we never got on the front foot in the first half. "In the second half, we kicked the ball behind them and the subs coming on was massive. It was pleasing to score those late tries. "George North will not walk into the side. He's a tremendous player but we've got to think who'll fit in best next week. "Ben Foden's injury is looking like 12 weeks. It could've been worse but it could've been better." Worcester: Pennell, Stephenson, Grove, Matavesi, Hammond, Mieres, Hodgson, Fainga'anuku, Brooker, O'Donnell, Percival, Galarza, De Carpenier, Betty, Thomas. Replacements: Stelling for Grove (66), Warwick for Mieres (52), Su'a for Hodgson (43), Andress for O'Donnell (61), Williams for Percival (66), Jones for De Carpenier (75). Northampton: G. Dickson, G. Pisi, Waldouck, Burrell, Collins, Myler, L. Dickson, A. Waller, Hartley, Ma'afu, Manoa, C. Day, Clark, Wood, Dickinson. Replacements: Artemyev for G. Dickson (75), Stephenson for Burrell (65), E. Waller for A. Waller (66), Haywood for Hartley (72), Mercey for Ma'afu (52), Lawes for C. Day (52), Dowson for Clark (56).